Gulfarium Marine Adventure Park has been active in marine animal rescue and rehabilitation for many years. The C.A.R.E. Center was developed in 2015 as a non-profit to facilitate and further our continued coastal conservation efforts. 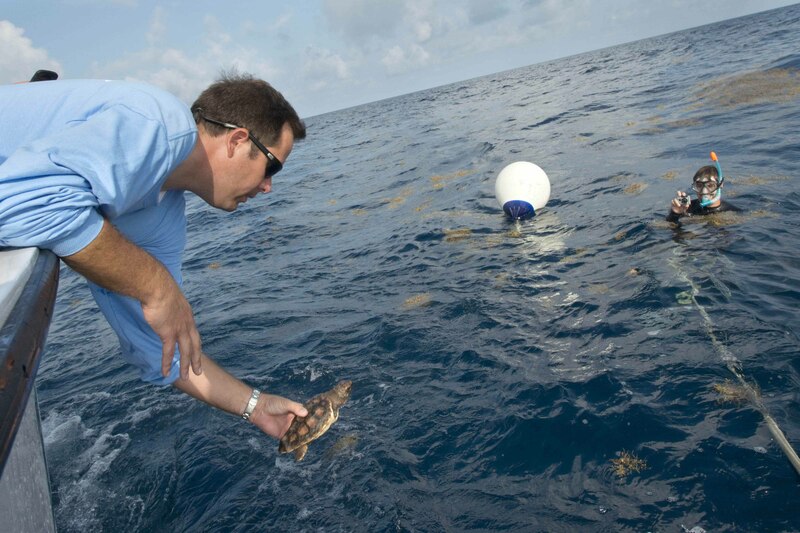 The program has helped to rehabilitate and release various species of sea turtles found in the Gulf Coast, from the Loggerhead, Green, Kemp’s ridley, to the Leatherback. 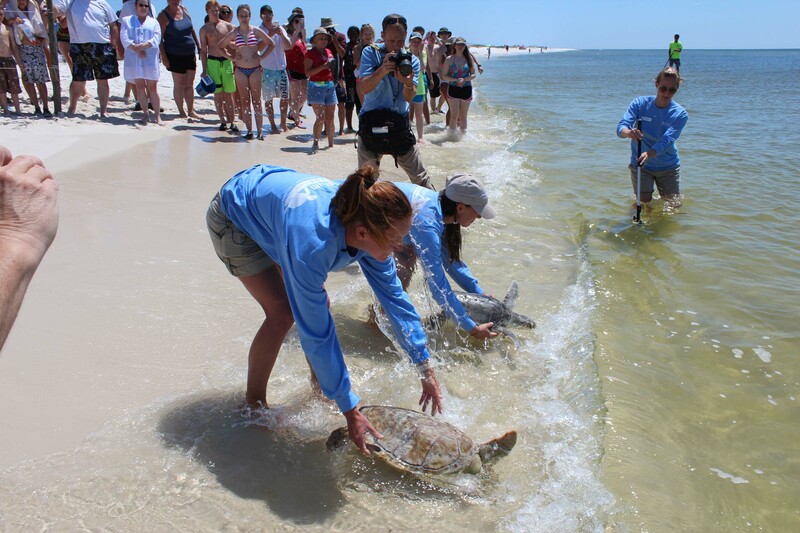 Over the years hundreds of sea turtles have been rehabilitated and released back into the wild by the Gulfarium. The Gulfarium C.A.R.E. Center acts as a beacon for coastal conservation through marine animal rescue and rehabilitation, encouraging awareness with public education and opportunities for active participation. Follow our C.A.R.E. Center on Facebook! When a sea turtle patient arrives, it is evaluated by animal care and veterinary staff using guidelines from the Florida Fish and Wildlife Conservation Commission. These guidelines give our staff the necessary information needed to evaluate a method for rehabilitation, recovery, and release. Along with the turtles being rehabilitated for release, Gulfarium Marine Adventure Park is also permanently caring for two Loggerhead sea turtles. They both originally stranded along the beaches of the Emerald Coast and have now been deemed non-releasable due to medical or physical limitations. Click here to Meet Our Animals and learn about rescued sea turtles and other animals that call the Gulfarium home. Continue reading to learn more about recent Gulfarium Marine Adventure park sea turtle releases or what you can do if you find a stranded sea turtle. What do I do if I find a stranded animal? If the animal appears to be injured or dead, call to notify the appropriate authorities. To report a stranded turtle in Alabama, call 1-(866)-SEA-TURT (1-866-732-8878), and in Florida, call 1-888-404-FWCC (1-888-404-3922). Do not touch the animal, remove it from the beach, or attempt to push it back into the water as this can cause the animal to re-strand and die. Instead, monitor the animal from a safe distance. While waiting for authorities to arrive, note the position of the animal and monitor its breathing. How close can I get to a sea turtle nest? Approaching within 50 yards of a sea turtle nest is illegal. Please observe from a distance. Why do I have to turn off beach lights at night? Lighting pollution is a serious threat to many types of wildlife, particularly nesting sea turtles. When hatchlings burst from the nest, they scramble for the brightest horizon, typically the moon glimmering off the water. Artificial lights can lead the turtles away from the safety of the water. From May through October turn all exterior lights visible from the beach off from dusk to dawn and avoid flashlights, fireworks, and bonfires on the beach. What can I do to ensure a clear path to the ocean for the hatchlings? Remove all beach chairs, umbrellas, and other items at the end of the day to avoid obstruction during sea turtle nesting season. Flatten sand castles and fill in holes at the end of your beach visit to create a safe path for nesting females and sea turtle hatchlings. The Gulfarium Sea Turtle C.A.R.E. Program promotes rehabilitation and release of all stranded sea turtle species. After the appropriate medical attention and care is provided, as deemed by a veterinarian, the sea turtle is release back into the ocean as close as possible to where they originally stranded. Here are a few release stories from the past. Staff members from the Gulfarium were astonished to see the numbers on the scale on which a recently stranded leatherback sea turtle was settled. Originally estimated at 500 pounds, the female turtle actually turned out to weigh 608 pounds just prior to her release back into the Gulf of Mexico. 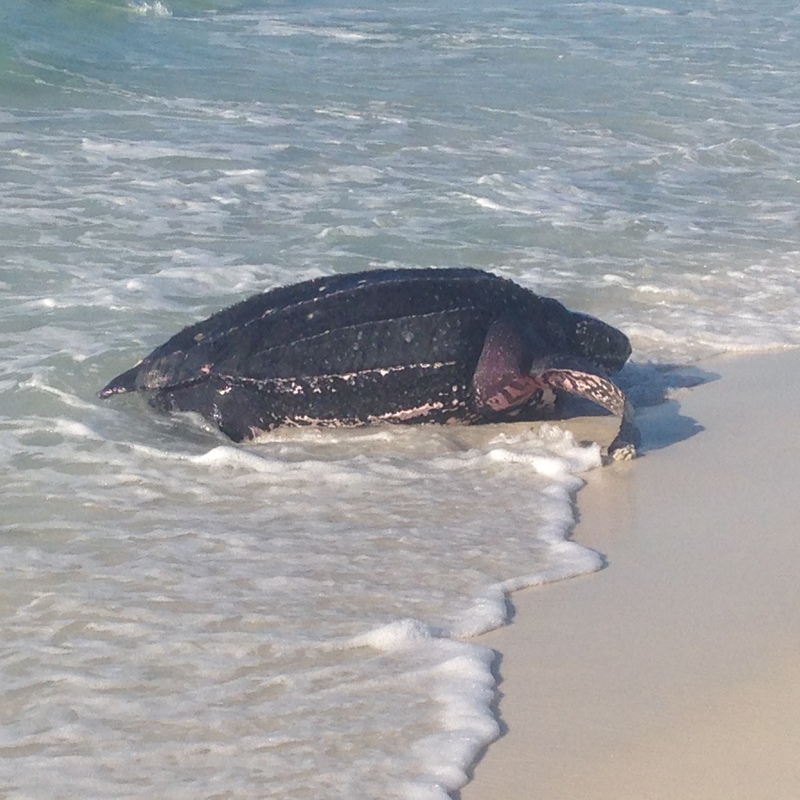 First noticed by beachgoer Dianne Masterson on Friday, September 18 in Pensacola Beach, the turtle appeared to struggle in the shallow surf about a mile east of the Portofino Towers. 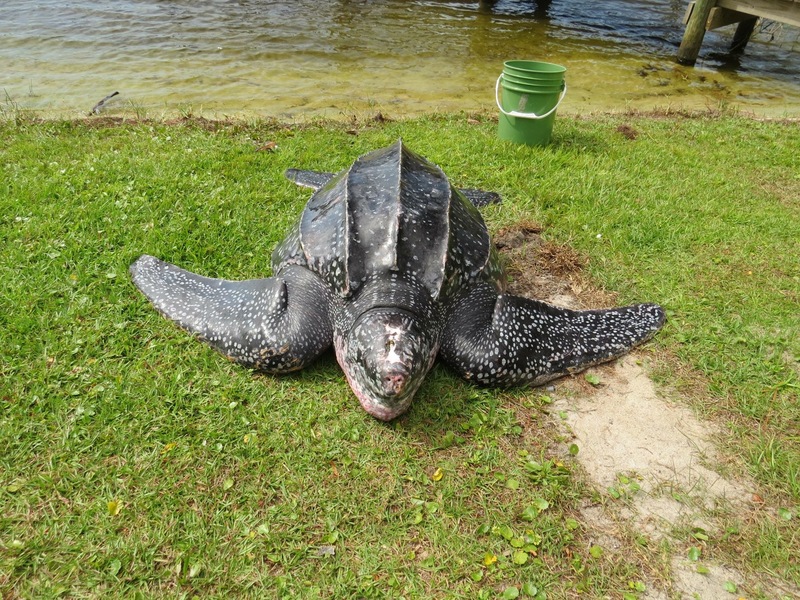 The Florida Fish and Wildlife Conservation Commission (FWC) quickly determined that rescue and treatment was necessary for the large leatherback. During a 4-day treatment period under Gulfarium's Sea Turtle CARE (Conserve, Act, Rehabilite, Educate) Program, the team completed an exhaustive series of diagnostic tests which enabled them to develop a treatment plan that included antibiotic, fluid, and laser therapies. Gulfarium staff veterinarian, Dr. Rebecca Wells reports, "Despite tests that revealed mild complications stemming from an old boat strike injury, within days the turtle demonstrated all of the skills necessary for release, such as diving and spatial awareness, and in consult with FWC and the National Oceanic and Atmospheric Administration (NOAA), the turtle was cleared for release." By chance, her timing coincided with the presence of a NOAA research team studying populations of leatherbacks in the panhandle. On Tuesday the turtle was loaded onto the team's 41-foot research vessel at the U.S. Coast Guard Station in Destin and was released 20 miles off the coast of Pensacola in an area where other leatherbacks had recently been seen foraging on jellyfish. 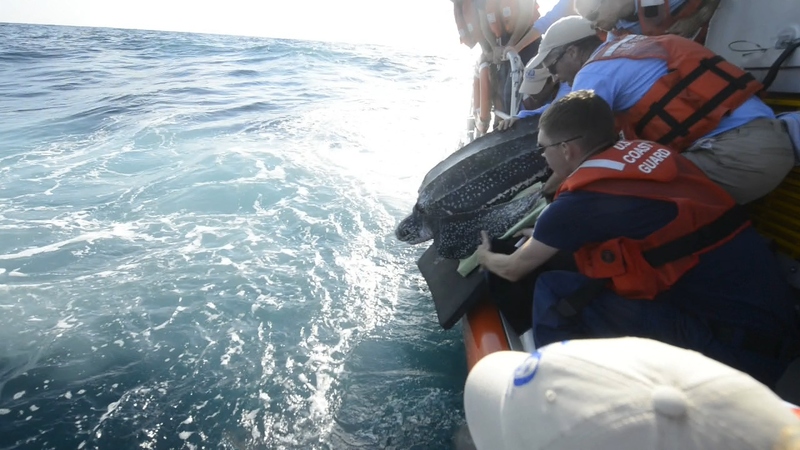 "We are happy to be a part of such a joyous occasion and team up with the Gulfarium to return this leatherback to the Gulf of Mexico," said NOAA's Research Fisheries Biologist Christopher Sasso. "Upon release the turtle took a dive underwater, resurfacing for a few breaths shortly thereafter. " The NOAA crew has been out since Saturday, locating leatherback sea turtles in these waters. Each turtle is measured and equipped with satellite tags to track long term movement and collect data on dive patterns and water temperatures. "This is the first directed research on leatherbacks in the Gulf of Mexico," said Sasso. "Very little is known about them including whether they are here all year long or just short term, and if it's the latter, which direction they are travelling from. We hope to answer some of those questions and obtain accurate information on these endangered animals." On June 25, 2015, the team from Gulfarium's Sea Turtle C.A.R.E. Program responded to a 5.5-ft. beached leatherback sea turtle in the Rocky Bayou backyard of a Niceville resident. It was presumed to be the same turtle that stranded in Tom's Bayou in Valparaiso a few days prior. While onsite, Gulfarium's staff and veterinarian gave an initial assessment, including blood sample collection and providing fluids. At the request of Florida Fish and Wildlife Conservation Commission and state officials, the 375-lb. turtle was transported to a temporary holding facility at the Gulfarium in order to provide further treatment. Veterinary and husbandry staff did exhaustive diagnostic work including x-rays, ultrasound, blood sampling, and morphometrics. Through this and consultation with other experts, we developed a treatment plan specific to the animal's needs and are provided round-the-clock care. Historically, rehabilitation of leatherback sea turtles has proved challenging, including the fact that they are less aware of boundary surroundings and can potentially run into walls. 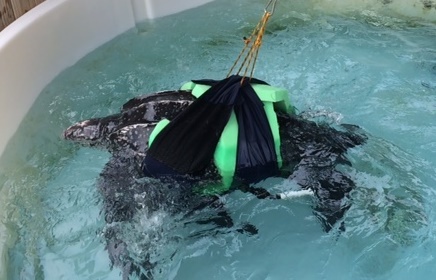 The veterinary and husbandry staff implemented an innovative sling and tether design to prevent the turtle from running into anything, while still allowing for full movement of both the front and back flippers. On the morning of June 28, Gulfarium’s Sea Turtle C.A.R.E. Program released the nearly 400-lb. 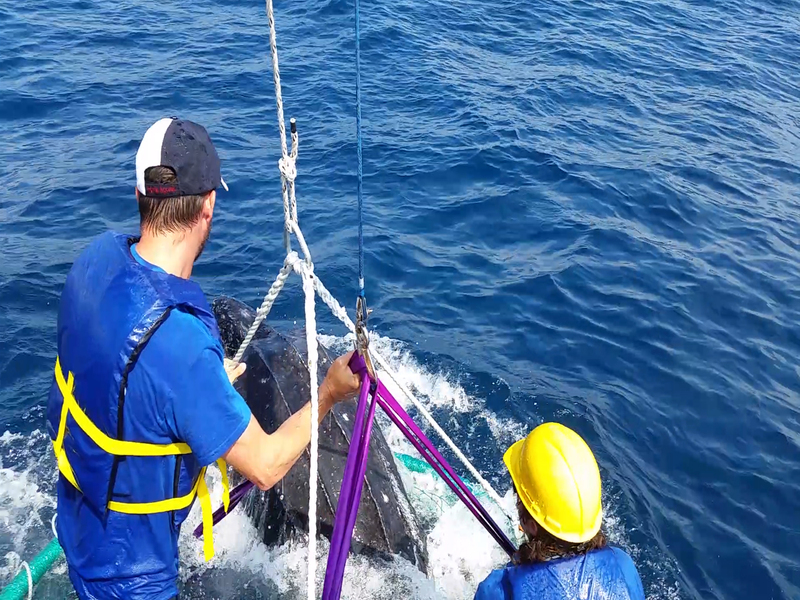 leatherback sea turtle into the Gulf of Mexico following a three day period of rehabilitation and treatment. With the generous assistance of the U.S. Coast Guard Heartland, Gulfarium veterinary and husbandry staff escorted the turtle 12 miles off Destin’s shore into 100-ft. deep water and gently guided the turtle off the boat. After a swift dive underwater, the leatherback surfaced several times before swimming away. 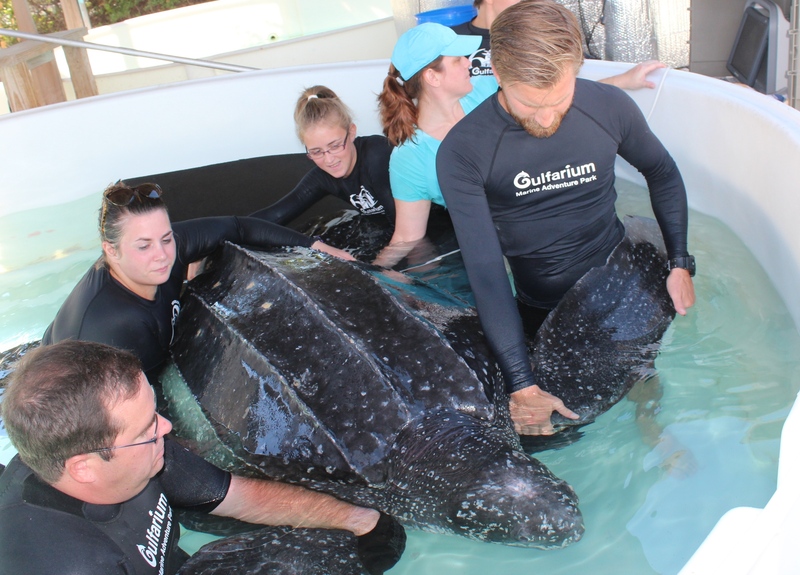 Gulfarium officials remain very optimistic for the leatherback’s chances of survival and are hopeful she will stay out in the deeper Gulf waters where leatherbacks typically reside. With newly attached flipper tags, authorities will be able to identify her should she come up to the shore to nest. All three green sea turtles were brought to Gulfarium Marine Adventure Park after being hooked off the Navarre Beach fishing pier at various times over the last few months. After undergoing successful procedures to remove the fishing hooks, Hazel, Kale, and Ivy have all completely recovered and have demonstrated the skills required for release, such as diving and eating without assistance. Incidental capture in fishing line is one of the greatest threats to sea turtles. If such an event occurs, the best thing to do is safely secure the turtle and cut the line, leaving at least one or two feet of line. Do not release the turtle and do not try to remove the hook or line as this can cause damage. Immediately arrange for transportation to the nearest rehabilitation facility. By the time he was released on July 7, 2014, juvenile loggerhead Captain Hook had nearly doubled in size since volunteer nest observers on Okaloosa Island brought him to the Gulfarium after noticing there was some difficulty in his mobility. With a safe environment and plenty of food, the turtle outgrew the issue and was deemed ready for release into deep water. Aboard a research vessel, scientists with the FWC and University of Florida executed a successful release into the safety of floating weedlines. Wendy and Tinkerbell, arrived at the Gulfarium in the fall of 2013 with very different ailments. Tinkerbell, a 20-lb green sea turtle, was missing her right front flipper and had several shell lacerations, likely due to an encounter with a shark. Wendy, a 14-inch long Kemp's ridley turtle, was severely underweight and having trouble diving down or swimming in a straight line. Both responded well to treatment, including stitches for Tinkerbell and antibiotics for Wendy and even despite the loss of Tinkerbell's flipper, the prognosis was good since turtles are very capable of thriving with just one flipper. This green sea turtle was brought to Gulfarium Marine Adventure Park in August of 2013 after inadvertently swallowing a fisherman's line while angling off the pier beneath Brooks Bridge. Fortunately, for the 12-lb turtle, the fisherman wisely contacted the authorities for assistance. The turtle, named Aaliyah, after the fisherman's niece, was transported to the park and given a full evaluation from veterinarians. After a successful procedure to remove the fishing hook, Aaliyah was thriving and was demonstrating the skills required for release, such as diving and eating without assistance. She was released on September 11, 2013 into the Santa Rosa Sound in Navarre Beach at Gulf Islands National Seashore. All three turtles were brought to the Gulfarium between October and December of 2013. Two of the small hatchlings were discovered washed up near Gulf Island National Seashore and the Pensacola Beach Pier with trauma injuries to their flippers, likely from predatory animals. The third was found near an emerging nest on Eglin property on Okaloosa Island after the nest had been washed out by Hurricane Isaac. Each turtle was successfully treated during the winter and spring and despite their injuries, including missing flippers on two of the turtles, were able to dive and find food. Staff members from Gulfarium’s Sea Turtle C.A.R.E. 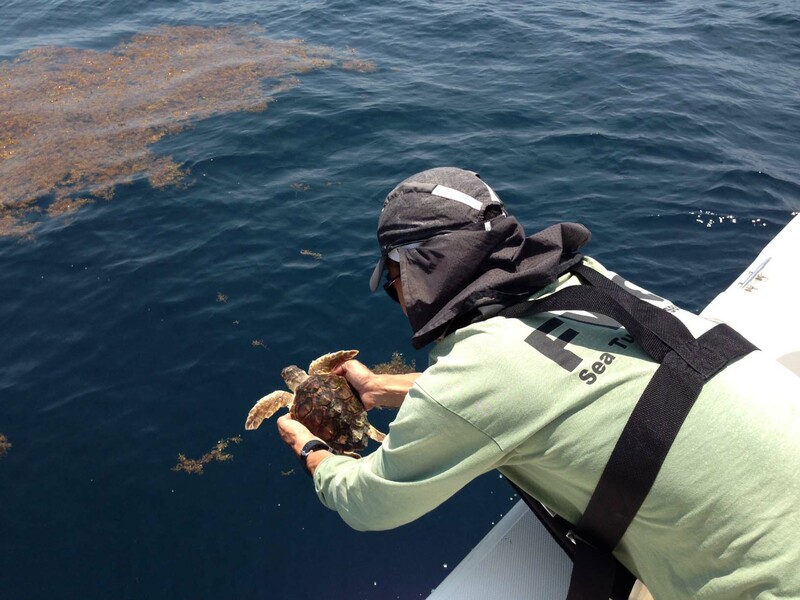 Program, assisted by Captain Don Dineen of Sure Lure Charters, transported the hatchlings several miles off shore to a large patch of free-floating seaweed, which will provide food and shelter, giving the turtles the best chance of survival. 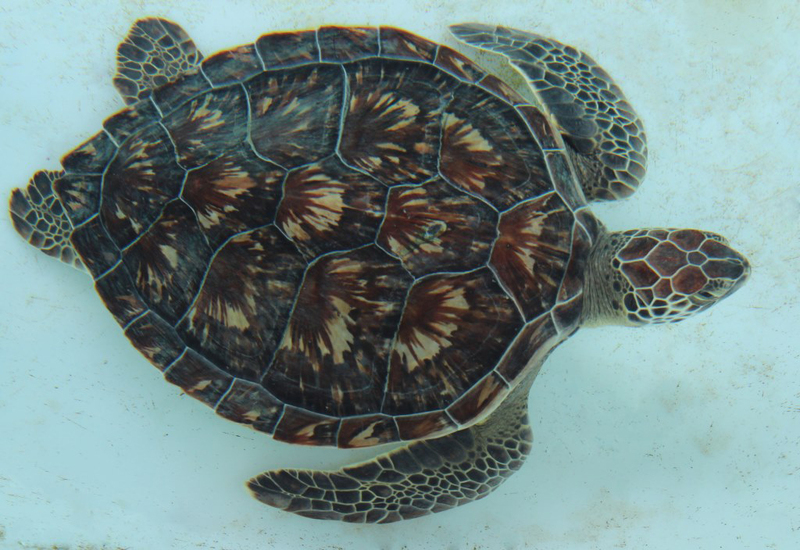 Our rehabilitation efforts are funded in part by a grant awarded from the Sea Turtle Grants Program. The Sea Turtle Grants Program is funded from proceeds from the sale of the Florida Sea Turtles License Plate. Learn more at www.helpingseaturtles.org.